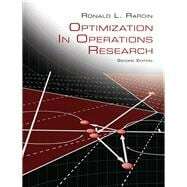 Rardin’s Optimization in Operations Research, Second Edition builds on the critically acclaimed first edition published nearly two decades ago and named Book of the Year in 1999 by the Institute of Industrial Engineers. The goal of the Second Edition is to make the tools of optimization modeling and analysis even more widely accessible to advanced undergraduate and beginning graduate students, as well as to researchers and working practitioners who use it as a reference for self-study. The emphasis lies in developing skills and intuitions that students can apply in real settings or later coursework. LIke the first, the Second Edition covers the full scope of optimization (mathematical programming), spanning linear, integer, nonlinear, network, and dynamic programming models and algorithms, in both single and multiobjective contexts. New material adds large-scale, stochastic and complexity topics, while broadly deepening mathematical rigor without sacrificing the original’s intuitive style. This edition also continues the author’s belief that making optimization materials accessible and exciting to readers of diverse backgrounds requires a continuing discourse on optimization modeling. Every algorithm and analytic principle is developed in the context of a brief story, and computational exercises often begin with a formulation step. Dr. Ronald L. (Ron) Rardin retired as Distinguished Professor Emeritus in 2013 after a 40-year record of leadership as an educator and researcher in optimization methods and their application culminating after 2007 as John and Mary Lib White Distinguished Professor of Industrial Engineering on the faculty of the University of Arkansas-Fayetteville. He headed the University’s Center on Innovation in Healthcare Logistics (CIHL) targeting supply chain and material flow aspects of healthcare operations in collaboration with a variety of healthcare industry organizations. He also took the lead with colleagues at Arkansas in founding the Health Systems Engineering Alliance (HSEA) of industrial engineering academic programs interested in healthcare. Earlier, Professor Rardin retired in 2006 as Professor Emeritus of Industrial Engineering at Purdue University after completing 24 years there, including directing the Purdue Energy Modeling Research Groups, and playing a leading role in Purdue’s Regenstrief Center for Healthcare Engineering. Previously he had served on the Industrial and Systems Engineering faculty at the Georgia Institute of Technology for 9 years. He also served the profession in a rotation from 2000–2003 as Program Director for Operations Research and Service Enterprise Engineering at the National Science Foundation, including founding the latter program to foster research in service industries. Dr. Rardin obtained his B.A. and M.P.A. degrees from the University of Kansas, and after working in city government, consulting and distribution for five years, a Ph.D. at Georgia Institute of Technology. His teaching and research interests center on large-scale optimization modeling and algorithms, especially their application in healthcare and energy. He is an award winning teacher of those topics, and co-author of numerous research papers and two comprehensive textbooks: a graduate text Discrete Optimization, published in 1988, and a comprehensive undergraduate textbook on mathematical programming, Optimization in Operations Research, which was published in 1998 and received the Institute of Industrial Engineers (IIE) Book of the Year award. Among his many other honors, he is a Fellow of both IIE and the Institute for Operations Research and the Management Sciences (INFORMS), as well as 2012 winner of the IIE’s David F. Baker award for career research achievement.